Even the safest riders have a high chance of being involved in an accident. Insurance is your safety net, covering the cost of repairs and treating injuries in the aftermath of the unexpected. But purchasing a policy isn’t just about protecting your finances. If you’re caught riding without coverage you could be fined and even jailed. If you’re wondering, “Do you need motorcycle insurance?” this blog will provide the answer. Attorney Brad S. Tabakin is a motorcycle accident lawyer and rider himself. He is passionate about protecting the rights of America’s two-wheeled motorists and has secured tens of millions of dollars in verdicts, settlements, and rewards for his clients. If you were involved in a motorcycle accident, call 877-333-0300 today for a free case evaluation. Whether you live in New Jersey, Pennsylvania, or most other parts of the U.S., you are required to carry insurance up the state’s minimum limits. Once you have purchased a policy that meets these requirements, you must keep a document proving you are insured – such as a letter from your insurer or a copy of the declarations page – with you at all times while you’re riding. If you’re caught driving with no insurance, you could be fined thousands of dollars, spend time behind bars, and may even have your riding privileges revoked. Even worse, if you are involved in an accident and cannot prove that you are insured, you may have to pay the cost of damages out of your own pocket. These dire consequences mean it’s in your best interests to purchase a policy. Regardless of whether you were insured or not, if you have been involved in a motorcycle accident, it’s time to seek legal assistance. Brad Tabakin is a motorcycle accident attorney who has spent 25 years representing riders from all walks of life. He can evaluate your case for free and determine whether you have grounds for a claim. 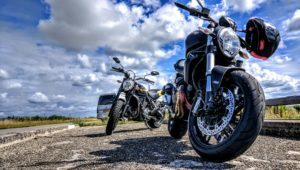 Now that we’ve answered, “Do you need motorcycle insurance?” a top motorcycle accident lawyer is here to help you navigate the legal system. To speak to Brad Tabakin, call 877-333-0300, and to keep up with the Bikers Have Rights community, join our Facebook group here.